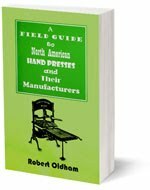 A Field Guide to North American Hand Presses and Their Manufacturers is designed and written to assist in the identification of “mystery presses” as well as to help the reader better understand the place of the individual examples in the pantheon of printing machines. It gives historical, contextual, and chronological information about the hand presses that may be found in museums, academic studios, printing companies, and private collections. This book is an important and useful addition to the library of any owner of a hand press, whether museum, corporation, or individual, as well as those who are curious about the fascinating history of these machines. A major goal for A Field Guide to North American Hand Presses and Their Manufacturers is to encourage printers, hobbyists, and the curious to seek out these remarkable specimens of printing technology of the past. The oldest surviving American-made hand press (1785). The press used by a prominent American Revolutionary War printer. The company that built more hand presses than any other company. The inventor of the impression mechanism used on almost all iron hand presses. That one company built more than 6000 hand presses over about 80 years, yet only fewer than 200 of them still exist? That the inventor of the most successful version of the hand press had his idea purchased from him under false pretenses? That Benjamin Franklin never even saw a Ramage press? 48 color photos of hand presses. Paperback with a sturdy sewn binding for permanence. Ordered directly, $15.00, plus $2.25 for shipping USPS. (bulk discount available).